So far, the Mirrored Foldback Pattern has been playing out very well. The swings and the ratios of those swings have proven to follow the structure surprisingly accurately. So how does that affect our current trade over the weekend and looking forward? The dark vertical lines represent the ‘Mirrored Foldback’ – which is just the past price action flipped and then repeated. What we are looking for is not the exact price or ratios to play out, we’re looking for the same kinds of swings around the same time, the shape and pattern should also be fairly similar, but it does not have to be. 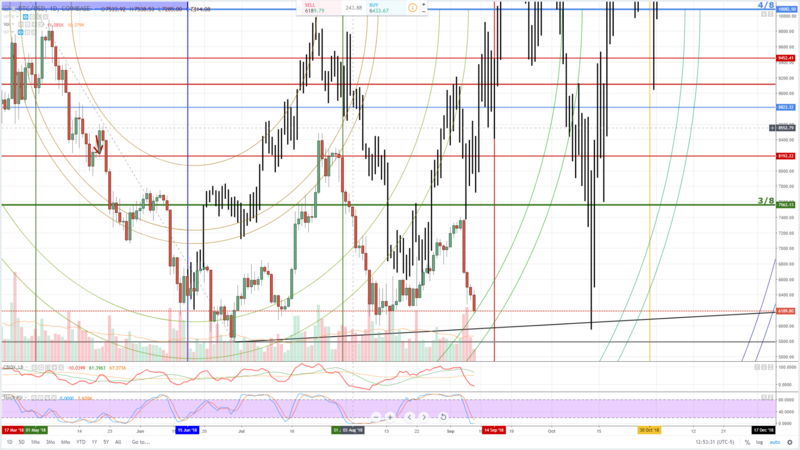 This is the daily chart we are looking at and according to the Mirrored Foldback, there are 3 to 4 down days create a massive swing lower, which is what we are experiencing right now. After that, there is a period of consolidation that precedes a massive rally higher. A question might be asked: If the Mirrored Foldback doesn’t show a lower low, if there is one that is formed with the current price action, does that mean the pattern is invalidated? The answer is no. Again, we are looking for primarily for the same swings to happen at the same time with similar ratios and structures/patterns. It is very possible for a new low to be created here and still remain within the pattern. However, price is sitting right on a support zone of time and price: Uptrend line, vertical pivot in time (red vertical line) and the green Gann arc. What does this all mean? And what about Trump?